The Central Minnesota Woodworker's Association is a group of men and women from around the St. Cloud Minnesota area who share a common interest in the art and business of woodworking. We meet monthly in St. Cloud to share information, techniques and topics of interest in the area of woodworking. Learn more about membership or support. Darren McKeever presented an introduction to Google SketchUp for woodworkers at the November 2010 meeting. Darren McKeever will be presenting an introduction to using Google SketchUp to design woodworking projects. Google SketchUp is a free 3D modeling software that can be used to design woodworking projects and create drawings, plans, cut lists, and more. Tim Revis will give a presentation on the Evolution of Kitchen Design at the St. Cloud Public Library. Brad Knowles will give a presentation on identifying woods. The August meeting will be at Glacial Wood Products in Brooten, MN, one of our advertisers. Note that we will meet to carpool to the plant, meeting at either the Holiday Inn in St. Cloud, and the Holiday Station in St. Joseph, MN. We will be leaving at 6:30, to be at Glacial Wood Products by 7:30 or sooner. The June meeting will be a tour of Wilkie Sanderson Cabinet Shop, Wednesday, June 16, 7 pm, 1010 N Summit Ave., Sauk Rapids, MN. Dave Oman led a discussion on tool maintenance and repair for the March CMWA meeting. Dave worked for Porter Cable for 12 years and more recently in the Mathew Hall tool repair shop. He now runs a repair service out of his residence should you need his expertise. 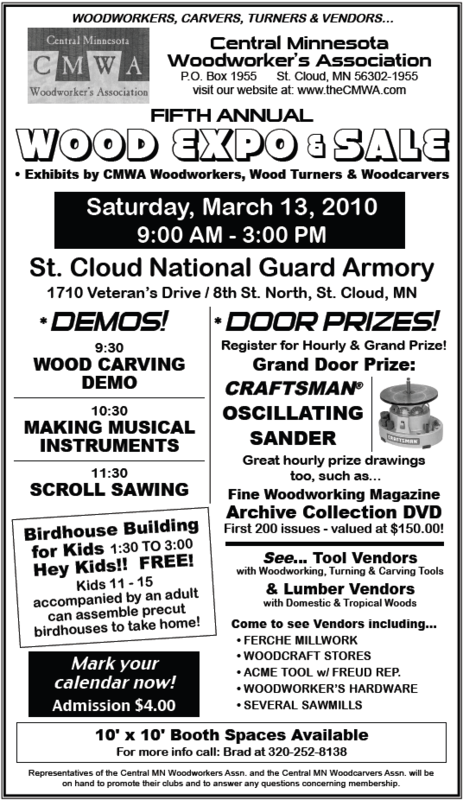 The 5th annual CMWA Wood Expo & Sale will be held March 13th, 2010. The event will run from 9am to 3pm at the St. Cloud National Guard Armory, 1710 Veteran’s Drive/8th St. N., St. Cloud, MN. Find out more about upcoming CMWA Classes. Want to support the CMWA?